The Dermaflage line makes you a better artist and gives you an advantage in today’s competitive makeup artistry industry. 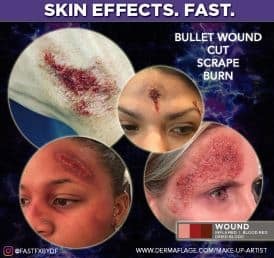 Whether you are a bridal, SFX, editorial or beauty makeup artist, Dermaflage ups your makeup game with innovative yet easy to use products that will set your work apart. Highly pigmented but no setting powder or spray needed! Tune in with celebrity makeup artists Denise and Janice Tunnell on to hear the Dermaflage story. Founder, Jocelyn Atkinson talks innovation and what’s next! Unlike anything else, Dermaflage topical filler is a silicone that mimics skin, used to fill uneven complexion issues that foundation can’t address like enlarged pores, acne scars, piercings- even gauged ears. Offered in 12 tones, Dermaflage starts in a honey-like consistency and finishes in a semi-translucent film in two minutes- it’s waterproof and lasts over twelve hours. Unlike corrective makeup for scars, Dermaflage fills and conceals a recessed imperfection. Dermaflage is now in stores!